The Manning Rippers Football Club is breaking new ground this season by unveiling an Indigenous Guernsey to be worn during their home game against Piara Waters on the 27th of May which coincides with the AFL’s Sir Doug Nicholls Indigenous Round. 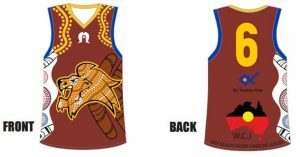 The final design incorporates various aspects of traditional Aboriginal heritage; on the shoulders of the jumper are yellow lines guided by dots on either side of it; representing the tracks left by our footprints. It signifies not only where we have been but also the direction we are heading. The tracks are on the shoulders of the jumper to signify the elders who carried us on their shoulders through the early stages of our lives and at the footy club. The 3 circles on the side of the jumper represents different meeting places. It signifies different people, from different places coming together. The 3 circles are a reflection of the different various landscapes experienced across Australia, those being; the coast, the desert and the rainforest. The Boomerangs represent war, and the fact that we go to war with our teammates every weekend when we play footy. It signifies that when we step onto the field we go hunting for the ball. The Dhari just below the jumper’s collar is a traditional headdress of the Torres Straight Islanders with the 5 point star representing the 5 main islands in the area. Both the Dhari and the star pay homage to the Indigenous players who come from the Torres Straight Islands. Finally the dot painting within the lion’s head represents the Indigenous culture coming into the club, coming into the hearts and minds of all who wear the jumper, with the lion being the traditional mascot of the Manning Rippers. This year the jumper will have additional meaning as one of the club’s Indigenous players sadly passed away during the offseason. Will Jackamarra was a beloved player at the club and was an integral part of the Manning Rippers Family, as a result the jumper also pays respect to him and the impact he had not only during his time at the club but also the legacy he left behind. On the back of the jumper is one of Will’s tattoos (the Aboriginal Flag inside the shape of Australia), his initials W.C.J and his personal life mantra “Get Ready. Work Hard. Be Good”. Sadly, in the footy community as in the wider one, racism is still an ugly truth. Manning Rippers Football Club is leading by example. Initiated by Aboriginal players and developed within the Club from a foundation of mutual respect, the Guernsey is a tangible product of Australians, both indigenous and non-indigenous working together to create a better future.